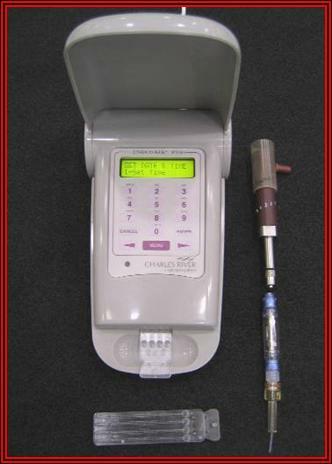 LOCAD-PTS (Lab-On-a-Chip Application Development–Portable Test System) is a hand-held device that can detect the presence of bacteria or fungi in record time. The device was tested aboard the International Space Station for the first time last month. The standard method of culturing suspect bacteria is far more time-consuming. Typically, the investigator must press a square of solid gel growth medium to a surface for a few moments, put it back in its package, and then let the sample incubate for a few days. LOCAD-PTS, on the other hand, takes only a few minutes. The investigator takes a sterile dry swab (similar to a Q-tip) and rubs it on the surface. 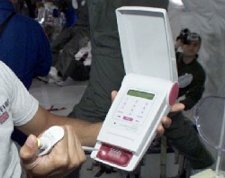 Then, ultra-clean water is flushed through the swab; a few drops of the liquid is dispensed into the LOCAD-PTS instrument. "The ability to monitor microorganisms would be especially important on long space voyages, not only to check the health of astronauts but also to monitor electronics and structural materials, which can be corroded or otherwise damaged by certain fungi and bacteria," says Wainwright. LOCAD-PTS is designed so that "astronauts can do the analysis onboard with no need to return samples to laboratories on Earth."